The silver circular cake board is a cardboard plate that serves as a tray. It is extremely useful when decorating a cake or presenting it at the table, on the occasion of a party. The material of which these are made cake boards is a very resistant cardboard, although they are disposable. In fact, once used, this tray can not be recycled to prevent water from wetting the cardboard lose its consistency. The practicality of using a silver circular cake board consists in its unique use. In this way you avoid the risk that your precious silver tray is lost in the bustle of a party, or that, worse, end up breaking due to an accidental fall. In fact, these trays are widely used to transport your cake to the party venue in an extremely easy way. 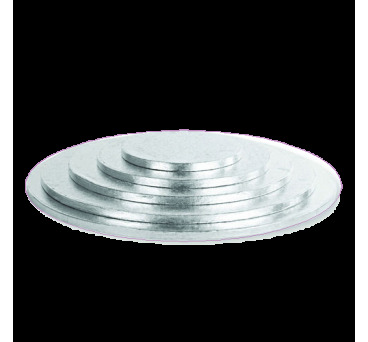 The silver circular cake board also serves as a shelf to decorate a cake. In fact you can mount the different layers of cake directly on the cardboard tray and facilitate transport from the worktop to the table. These trays can also be mounted on polystyrene structures to create raised shelves on which to place multiple cakes, creating a spectacular and wonderful effect for all your guests by presenting your creativity. The round pastry tray in variety of sizes is what you need to present your cake to your guests. With the round pastry tray in variety of sizes you will not have to worry about resizing the size of your cake depending on the size of the cake you have. The round pastry tray in silver coloured cardboard is available with a diameter of: 10 inches, 11.75 inches, 14 inches, 15.75 inches, 18 inches and 20 inches.